February may be the shortest month, but we packed in plenty of cold weather and frozen precipitation during the past 28 days. The infographic below includes some statewide headlines from the past month. Click any underlined heading in the graphic to read more about that topic, or scroll down to read our full climate summary. If you were born in the 80s or later or have moved to North Carolina since then, this was probably the coldest February you've ever felt in this state. The preliminary rankings show it was the 10th-coolest February since 1895 and the coldest since 1978. And many weather stations ranked even higher than that. Among stations with 100+ years of data, Hatteras tied for its third-coolest February, Raleigh tied for its fourth-coolest February, Greensboro and Wilmington each ranked fifth all-time, and Charlotte and Asheville ranked seventh based on average mean temperatures. Minimum temperatures on February 20th. Those numbers are even more impressive when you consider that the month didn't start off on a cold note. The first two weeks were fairly average, with a few cooler days but also several days with highs in the 60s and low 70s. However, beginning on Valentine's Day, a series of Arctic cold fronts moved through and kept us in the freezer for the last two weeks of the month. The week from February 15th through the 21st was particularly cold, with average temperatures in the low- to mid-20s. For many sites, it ranks as one of the top-ten coldest Sunday-through-Saturday weeks on record, including the fourth-coldest week in Raleigh since 1944. Temperatures struggled to get out of the 30s most days that week, and lows on Friday the 20th (see map above) reached the single digits and even colder in the mountains. We'd waited all winter for some snow, and it finally arrived in February -- at least for most of the state. The first event on February 16 and 17 was a light snow event for the Mountains and Northern Piedmont, a mixed precipitation event along and just south of I-85, and mainly rain or freezing rain for the Sandhills and Coastal Plain. The next afternoon, a quick round of snow showers brought a dusting to some spots. The following week saw even more wintry weather. On the 24th, snow showers persisted throughout the day, and the Triangle came away with an inch or more of accumulation. And that was just the precursor to the most significant wintry event of the season. On the 25th and 26th, a moisture-rich coastal low delivered six or more inches of snow to Boone, Asheville, and Greensboro. South of there, temperatures about a mile off the ground crept above freezing, so snow turned to sleet and freezing rain, and the wet snow built up on trees and power lines to cause nearly 200,000 power outages. The quick succession of wintry events meant that locations including Asheville, Greensboro, and Raleigh received more than their normal annual snowfall within a ten-day period. With 3.1 inches so far this winter, Charlotte is still about an inch away from its normal snowfall of 4.3 inches. Multi-sensor Precipitation Estimates for February 2015 show three or more inches of precipitation fell across the eastern half of the state, but drier conditions in the west. Above-normal precipitation in the eastern half of the state and below-normal totals in the west averaged out to give the 46th-driest February in the past 121 years. 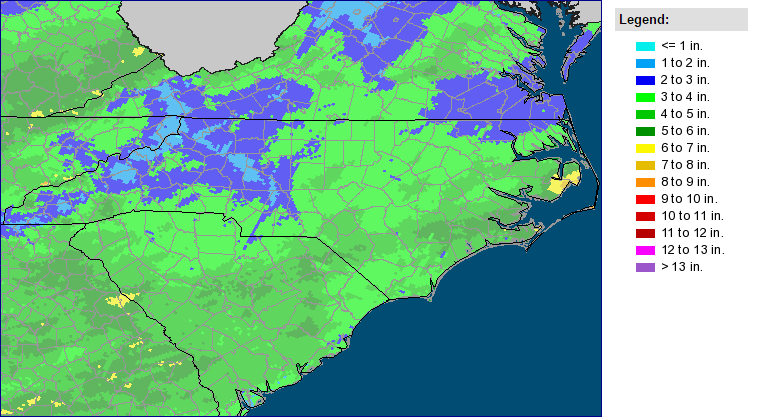 Despite the snow events in the Mountains and Western Piedmont, much of that region saw less than two inches of liquid precipitation in February, which puts them at a continuing precipitation deficit for the winter so far. Because of this recent dryness and low streamflow levels, the US Drought Monitor expanded the range of Abnormally Dry conditions to include about a third of the state. We still haven't seen drought conditions in North Carolina in almost two years, but as temperatures begin to warm up and evaporation increases this spring, these already-dry regions could be at risk of falling into drought as the growing season begins. As a reminder, you can always track high-resolution drought conditions across the state using our experimental Drought Trigger tool. Let the CoCoRaHS March Madness Begin!